View of the Main Road at Lower- & Upper- Huayan Monasteries south entrance. 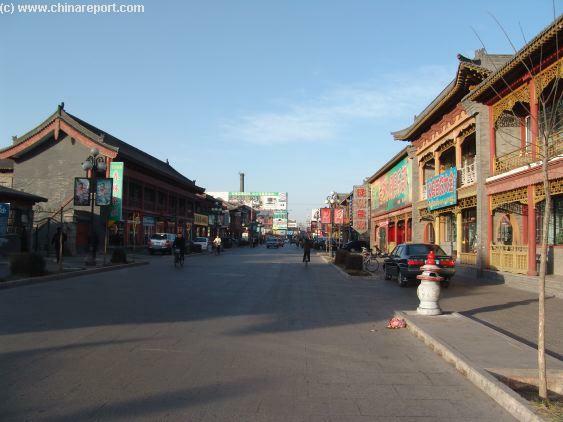 From here directly to the Drum Tower and the Hutong of Datong's Old City. 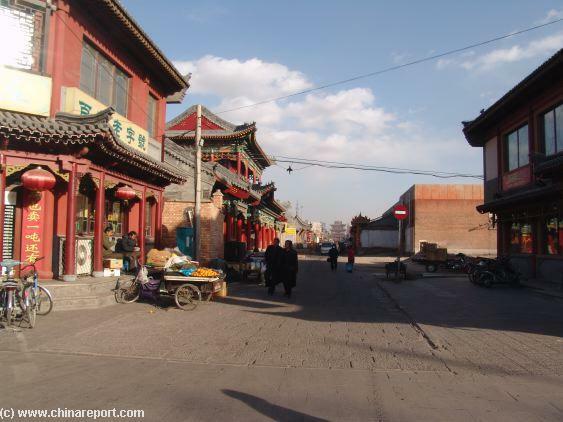 The partially unpaved Road to Datong's 3 Story Drum Tower and some of the cities' oldest housing. 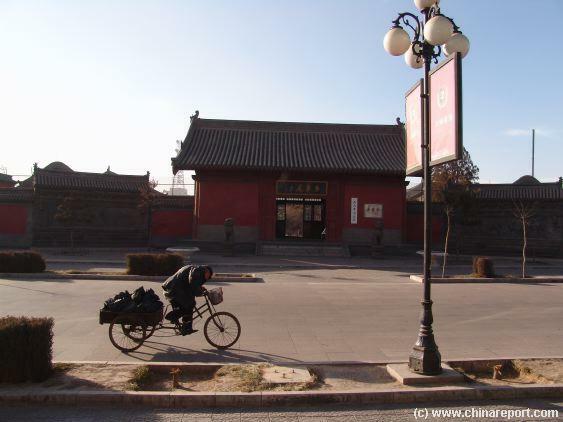 A local rickshaw man fighting the everpresent Gobi-wind on the road in front of Lower HuaYan Monastery Entrance Gate. The Gate to Upper Huayan Monastery is through a wide-alley almost adjacent the Lower Monasteries Entrance. 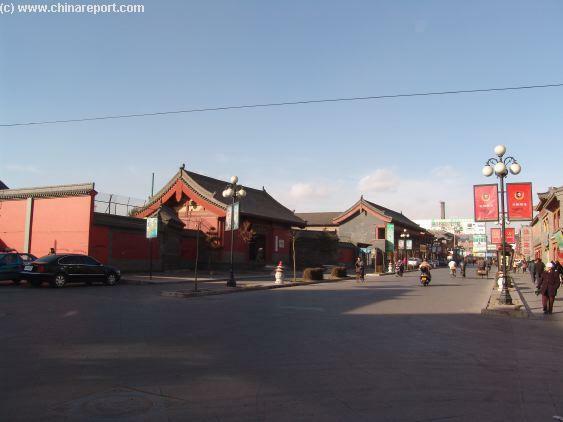 A view along Main Road in front of Lower HuaYan Monastery South Gate. Immediatly Left and North a wide alley leads up to the Upper HuaYan Monastery. A view along Main Road towards the West and the corner of an unpaved alley leading through rapidly disappearing Old City (small) Housing towards the Cities drumtower. Less then a mile further down are the city walls. 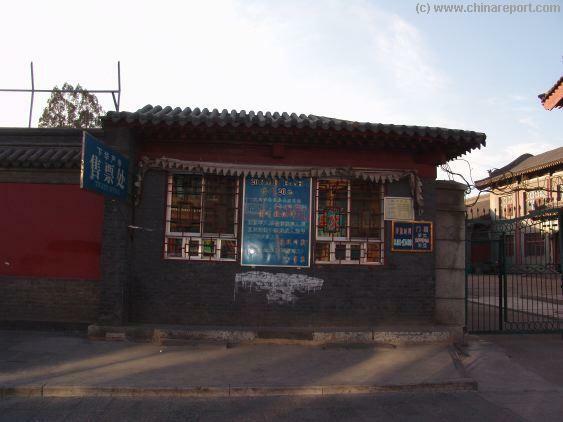 The small ticket office just right (East) of the South Main Gate to the lower HuaYan Monastery. Don not expect any English ! You are in one of the poorest parts of China ! How to get there - Datong can be a rather confusing small City, especially due to the fact that the New City and railway station are located North and away from the Old City Center. 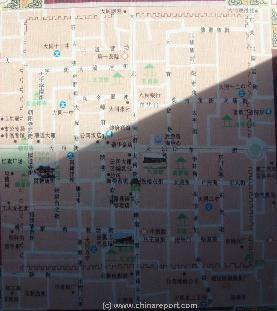 Once you have found the Old City however, navigation becomes a lot easier. Find the large HuaYan Monastery Complex at the very heart of the Old City, just west of- and within view of the rather insconspicuous central intersection within the square old city. The two adjacent HuaYan Monasteries together are the largest Temple Complex within the city and are thus easy to identify on sight, especially when walking along the west-east boulevard near the central intersection. If you are staying at the Yungang Hotel you should be able to view the Monastery grounds from your Hotelroom window. 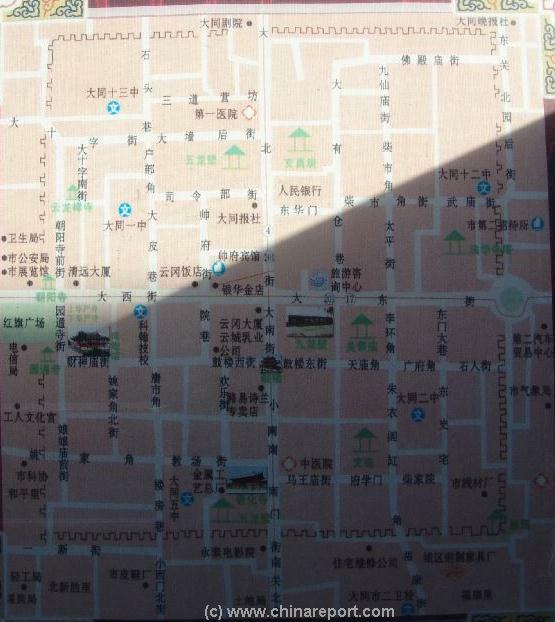 A schematic map of Datong Old City Center marking the locations of all Main Landmarks, including the earthen Old City Walls. IF you have experience in finding chinese temples you may be confused here. Usually the Temple's Main Ceremonial Gate is located at the South of a Temple or Monastery Complex (for Feng Shui related reasons). 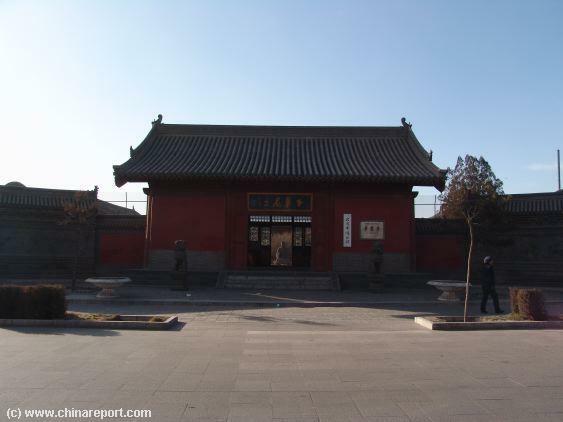 In this case the Main Gate should be one street away still, however, at the HuaYan Monastery this is not the case. Due to significant play of history, the reign of the Khitans (QiTians) and a religious peculiarity explained later, the Main gates are both located in the East, facing the rising Sun rather then Noon Hour. There is thus no need to search any further for the main gates as you have already arrived. Find the wide entrance alley leading to Upper Huayan Monastery on your right hand when coming down the Street. Due to the abundance of colorful tourist-like stalls offering a staggering amount and variety of Buddha-ware one cannot miss it. If unsure, you should be able to see the Upper Monastery Main Hall of the Monastery clearly, looming at End of the the Alley, or so it seems. The smaller and lesser Lower Huayan Monastery has its far less impressive Main gate just some 70 meters or so futher down the street. Needless to say, an entrance fee is required before entry at both Monasteries. Tickets to the lower Monastery are available just to the right of the Wooden Main Gate, at a small brick box housing the ticket office. Tickets are a pitance so we won't bother you with current prices, which may change.There are no double tickets available for a combination tour of both Monastries. important and interesting chapter in the history of China as a Nation. to find the Entrances to both Monasteries, located some ways down this side-street. With internal tourism in China exploding after new and freer travel regulations were proclaimed by the Government in 2004, the area surrounding the HuaYan Monasteries has recently become the target of some tourism related development. As a result there is a growing number of restored ancient-style buildings housing shops and restaurants along the main road outside the two Main Gates. With increasing affluence of chinese people and development of mass tourism in China, this trend is expected to continue. In the case of HuaYan Monasteries, so far the developments have been a positive contribution, the restored fronts enhancing athmosphere surrounding the Temples, and good restaurants catering to a hungry and before and otherwise starved tourist or traveller. Dwell across the street from lower HuaYan Monastery Main Gate to find some of the oldest housing remaining inside the City. Currently endangered as in many places in China, these original "Hutong" give a good sense of the average city citizens dwelling, common until very recently. Small houses and shacks line the so far unpaved street leading away to the Drum Tower about a kilometer away. 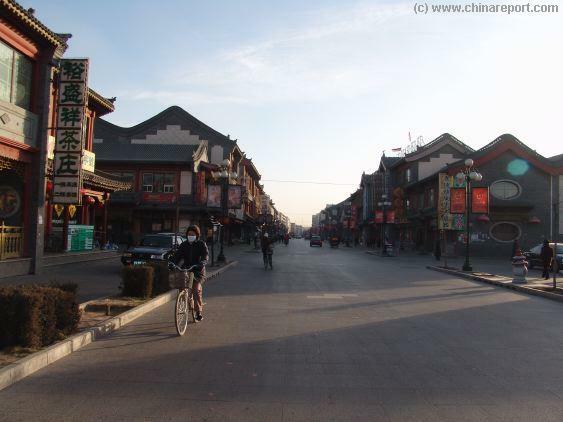 Enjoy these "true" Datong Street while they last and get a great sense of regular Shanxi life, otherwise only found in the many small villages in the nearby area and Shanxi Province. Hutong housing is rapidly being replaced by modern appartments forming the face of the new city. Charm is lost. Get there soon ! civilization within itself. Influenced from all sides, and by many peoples, the HuaYan Monasteries stood for centuries forming the beating religious and cultural heart of it all. For traders, travelers, soldiers and pilgrims alike, this was their City Temple. Music Bonus - "Datong"- Instrumental Chinese Song on Bamboo Flute.